This quilt has been done for a few weeks but getting appropriate/worthy pictures of it has not been easy. But here it is: I am really, really happy with how it came out. I long-arm quilted it at Laurena's studio in Burlington, MA and had a wonderful day completing it. It was the fifth quilt I have done there and I finally felt comfortable with the huge machine and didn't feel like I had to be babysat by Laurena. (But let me just say that she never makes you feel weird or guilty for asking for help - I just enjoyed being able to be more independent!) It took me 5.5 hours to quilt - but the time flew by because I was really happy with how it was turning out. I backed the quilt with Moda Bella Solid in Black - much softer than some of the more popular solids out there! You can see the quilting the best on the back - I stippled on the white parts and outlined the hearts 4x each in light blue variegated thread- you can't really tell that the thread color changes though. I had planned on quilting within each of the 600 dresden fan pieces and I tried doing this on three of the fans before I stopped and realized it looked horrible. It took a few minutes of scheming and pacing - and I finally realized, I don't have to quilt in the fans at all!!!! Thank goodness for that realization - I love how the dresdens "pop" now and I would've had to come back a second day - as there would've been no way I would've finished it in one day. Some quick information on the fabrics used: the heart fabric is a Nigerian wax printed fabric I bought in Uganda four years ago, the white background is Kona Cotton white, and the print fabrics used in the fans include more Kona, a shot cotton, some Jennifer Paganelli, Daiwabo, Henry Glass, some random black and white pritns, and another African fabric I bought in Uganda. It was bound with Kona Pacific. 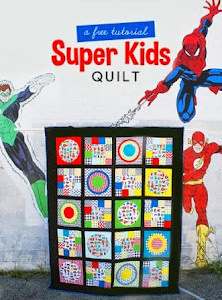 I have been accused of using very literal names for my quilts - and it's true (previous favorites include - Tufted Tweets, Urban Circus, and Good Folks quilts - guess what they were named after???? - the fabric collections I used - I know, I know, I am so inventive!) 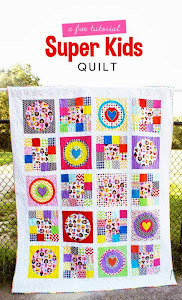 I have been calling this quilt my "African Heart Dresden quilt" - what a mouthful! So now I am christening this quilt with a new name, "My African Heart." I have lived and volunteered in both South Africa and Uganda and the whole continent has a lot of meaning for me due to the good and bad experiences I had there. I like that my quilt is joyful and bright but also has a bit of an "edge." It's easy for me to romanticize my experiences abroad but in reality, there were some tough lessons I had to learn. I am happy with how I chose to use the Heart fabric as the theme for this quilt - hopefully it won't take me another four years to think up a good idea on how to use the rest of my fabrics from Africa. congrats on finishing it! and i like the meaningful title, too. Very eye-catching. I like that you fussy but the print for the center of the Dresden plates. I am saving fabrics for an African quilt, too! My sister goes back and forth between home and Ghana (she does medical work there) and brings me fabric each time. I have some lovely prints and I can't wait to use them all in one giant, bold, quilt! This is stunning Laurie!!! I agree with Rachel, the back is amazing when you see it all like that! What a wonderful way to remember your trip to Africa. Laurie this quilt is beautiful! Great job!